Pizza Pasta Bake Recipe — Pip and Ebby - easy, delicious recipes! A pizza, pasta dish and casserole all in one! This is such a popular meal in our family and is loved by ALL. Include all the pizza topping favorites you love. You can't go wrong with this delicious dinner! I'm coming down off my morning coffee high. Yowza! I am not a frequent coffee drinker, so when I do have a cup I get a little nutty! Instead of walking to the bathroom like a normal person, I found myself RUNNING to the bathroom a few times this morning. I caught myself in the act and wondered what the heck my husband had put in my coffee! I'm feeling much more normal now. Time for another cup! Kidding. And by the way, this isn't the only dual-purpose meal on my blog. What about this Spaghetti Bake that can't decide where it fits in? Or this Pull Apart Pizza Ring that can't decide if it is pizza or bread? 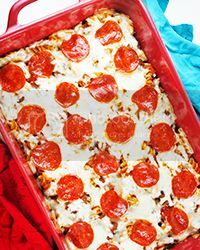 Making a delicious pizza flavored casserole is easy! Follow the instructions below. Cook the ground beef and onion in a large skillet. Throw in some spaghetti sauce (Homemade Pasta Sauce is best!) and cooked pasta. Mix it all together and throw it into a baking dish. Top with mozzarella cheese and pepperoni and pop that baby in the oven. Thirty minutes later, you'll have a happy belly and a happy family! Extra Cheese - Colby, Monterrey Jack, Cheddar, Parmesan! If you like a little kick to your pizza, a simple way to spice it up would be to mix some pasta sauce and the pizza sauce with a half teaspoon of red pepper flakes! A pizza, pasta dish and casserole all in one! This is such a popular meal in our family and is loved by ALL. Includes all the pizza toppings favorites you love. Can't go wrong with this delicious dinner! Preheat oven to 350 degrees F. Coat a 9x13 baking dish with cooking spray and set aside. Cook ground beef in a large skillet over medium-high heat until meat is no longer pink. Drain excess grease and add onion to skillet. Cook over medium heat for an additional 3 to 5 minutes, or until onion is soft and fragrant. Add salt and pepper, along with the spaghetti sauce and cooked pasta. Cook until sauce is warm, about 5 additional minutes. Add contents of skillet to prepared baking dish. Top with mozzarella cheese and pepperoni slices. Bake in preheated oven for 30 minutes.